This entry was posted in Bad Instructions. Bookmark the permalink. 7 Responses to Bad Instructions, Cont. A few years ago, we visited Playa del Carmen. Since the city was so close to the groundwater level, and the ground was basically porous like a sponge, flossing toilet paper causes problems because it washes downstream and stinks up the beaches. 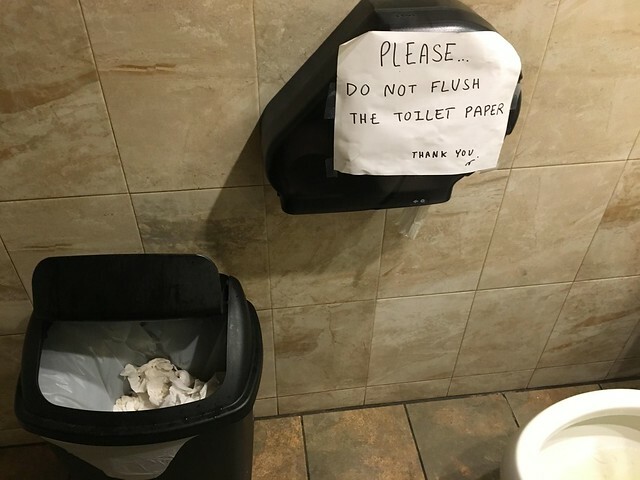 So we were told not to flush toilet papers….. So it stinks up the bathroom. Fortunately, soiled toilet paper makes great compost. In the athletes’ accommodations at the Sochi Olympics in Russia, similar instructions were posted because the toilets were so badly designed that toilet paper could easily clog them. Instead, each bathroom was provided with a metal trash receptacle to throw the used toilet paper into. This receptacle was quickly dubbed “the Poo Tin” by the athletes. No joke. This was actually reported at the time. The one sign that all public toilets need is “FLUSH TOILET AFTER USE”. Walking into a toilet stall with an unflushed john is disgusting. I remember traveling Europe by rail in 1999 all the TP on the track bed. Even in stations. Was there also a butter knife nearby to cut any logs into 1″ pieces prior to flushing?? ?